Learn to honor Christ with every word we speak, post, and write. As women, we are constantly presented with opportunities to use our words for good or for harm. How we speak about others, what we post online, and even thoughtless statements we make in the privacy of our homes can all have a profound impact upon our own life and the lives of those around us. When our words serve an eternal purpose they can be amazing tools to build the Kingdom of God. When they serve a destructive purpose they can be dangerous tools in the hands of the enemy to wreak havoc on relationships. 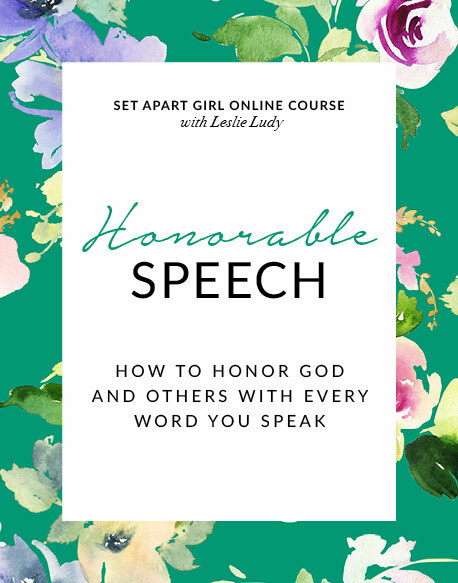 In this practical course, Leslie shares principles for truly honoring Christ with every word that we speak, post, and write. Learn how to avoid dangerous pitfalls like gossip, criticism, negativity, and foreboding, and choose life-giving, God-glorifying speech in every area of your life.